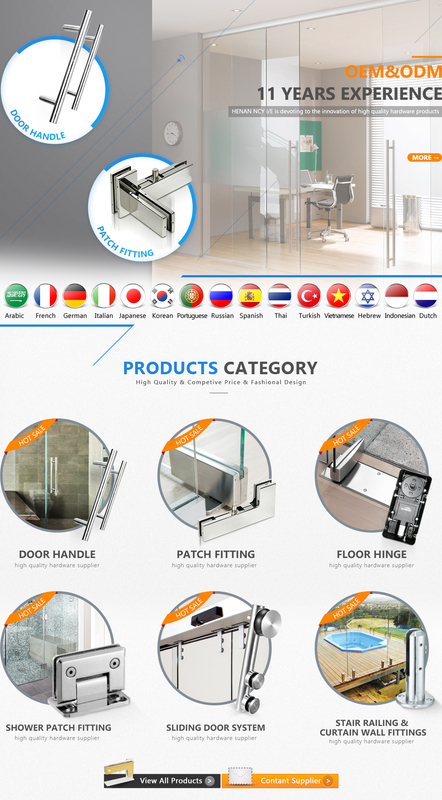 CHENGYU HARDWARE MANUFACTURE is professional make high quality building material supplier in glass door handle, patch fittings, floor hinge, shower fittings, stair fittings, as well as the customized hardware products. our factory have more than 15 years HENAN NCY I/E CO.,LTD. is the branch of Chengyu Hardware Manufacturer Co., Ltd. We have 15 years production and 6 years export business experience in offering wide ranges of hardware in best price. Our main products are glass door handles, patch fittings, bathroom hinges, glass door locks, furniture fittings, balustrade fittings.we can supply best price in good quality and perfect service. Our products are suitable for all sorts of countries and people. Our wide experienced designer groups launch new items every month. You have more selection in our website. Our technologists can take your ideas into actual samples. Chengyu hardware have a team of qualified and professional management elites and dedicated employees who strictly control the quality of raw materials & handwork products. Advanced equipment and production technology ensure high quality products, prompt delivery and excellent service. We are enjoying a good reputation all over the world. We have mature and pleasant business cooperation with our old customers, including world-class companies. Though Chengyu hardware has got much business achievement in the past years, we are looking forward to your good suggestion and business opportunities. We will take good care of your inquiries and orders!